The European RCE Meeting 2016 (#RCELondon2016) will take place at London South Bank University (LSBU) on 23-24 June 2016. 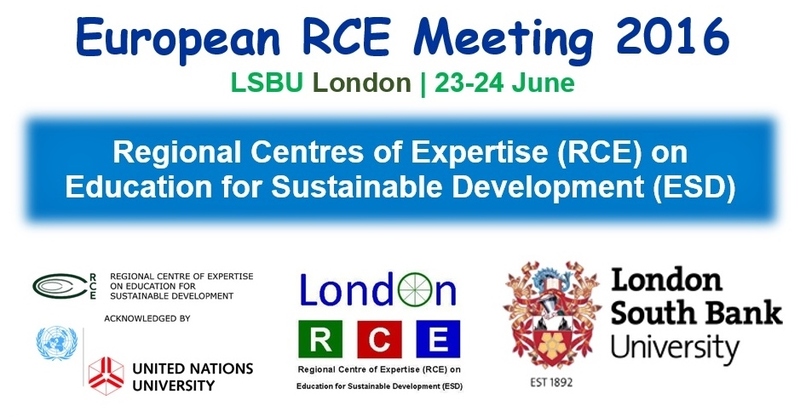 In this two-day event hosted by the London Regional Centre of Expertise (RCE) on Education for Sustainable Development (ESD) and LSBU, participants will focus on finding synergies in the European RCE community and on tackling thematic challenges under the current policy frameworks COP21, SDGs (Sustainable Development Goals) and TTIP. They will also aim to identify within the GAP (Global Action Programme on ESD) key priority areas in which RCEs can collaborate. Day Two will centre around Technical and Vocational Education and Training (TVET) and migration issues. With a focus on GAP Priority Action Area 5, i.e. accelerating sustainable solutions at local level, a plan from the RCE perspective will be drawn for encouraging local communities and municipal authorities to develop community-based ESD programmes. Members of European RCEs as well as anyone interested in becoming an RCE in Europe is also welcome to attend this meeting. Logos in the graphic are from respective websites.